Drug Development & Delivery magazine recently spoke with several of these testing providers to find out what services they offer, trends they identify, and how they have specifically addressed clients’ needs during the past year. 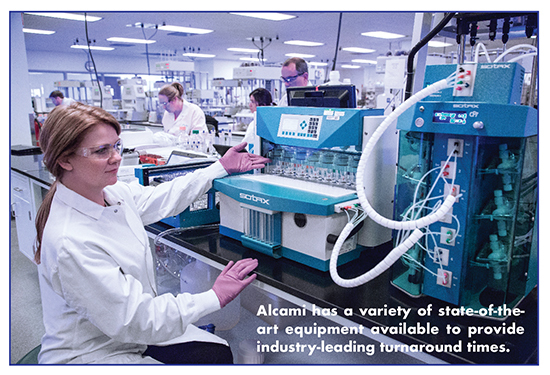 As a full-service CDMO, Alcami supports all phases of pharmaceutical development (from API characterization to finished product formulation to clinical and commercial manufacturing and stability) offering a breadth of services. For example, Walter Holberg, Scientific Advisor-Operations Lab Support, Alcami, explains the conversion of one API crystal form to another poses a potential risk to patient safety by potentially altering drug release. To mitigate this risk, Alcami offers comprehensive crystallization studies in concert with polymorph identification using differential scanning calorimetry, thermogravimetric analysis, and X-Ray Crystal Diffraction. Several trends in analytical testing are being attributed to new FDA regulatory requirements for all new drug products effective June 2016, and for all commercial products effective January 2018. For example, advancements in analytical testing for quantitation of elemental impurities in prescription and non-prescription human drug products are on the rise, specifically using plasma spectrometry, ICP-MS or ICP-OES, to screen and/or accurately quantitate the presence of any elemental impurities of interest. Alcami offers value-added risk assessment screenings using scientifically sound methods for the analysis of APIs, excipients, and drug product. To illustrate Alcami’s expertise in this area, Mr. Holberg explains how one client contracted Alcami to manufacture a generic product for the U.S. market that was listed in both the USP and European Pharmacopoeia (Ph. Eur.). While Alcami manufactured the finished product, the client obtained the API from another source. When the API was originally tested, it met all USP requirements; however, several months later when the drug product was tested for manufacturing release, a single impurity was identified that was greater than the ICH threshold for unknown impurities, thereby putting the manufacturing campaign at risk. In addition to purity challenges, there are challenges presented when testing small molecules, such as that an increasing number of novel therapeutic agents are either poorly soluble or difficult to detect with traditional techniques. Will Boomershine, Principle Scientist-Structural Chemistry & Biotechnology, says Alcami scientists have experience with analyzing and detecting poorly soluble molecules using non-traditional techniques, such as evaporative light-scattering detection (ELSD) and charged aerosol detection (CAD), as well as other non-spectrophotometric technologies, such as electrochemical, conductivity, refractive index and multi-angle light-scattering (MALS) detection. One of the significant challenges with biologics is demonstrating biosimilarity. Alcami can overcome this challenge through primary sequence confirmation, activity binding (equivalency), and higher-order structure analysis, which uses both glycosylation and impurity profiles, and is a central requirement of the ICH Q6B guideline document. A second challenge that often presents itself is the characterization and analytical development for antibodies and antibody drug conjugation (ADC). Alcami provides solutions to this challenge through the development and validation of purity methods. These include chromatographic purity techniques (SEC, IEX, RP) and electrophoretic purity techniques (SDS-PAGE, IEF, CE, iCE). Activity binding can also provide answers to this challenge through cell-based bioassays. Conjugation analysis, concomitant analysis of free drug, total antibody, and antibody drug conjugates can also help provide solutions to issues that may arise during the characterization and analytical development for biological drug products. Avista Pharma provides a full range of analytical services to pharmaceutical and biotechnology companies supporting both early and late stages of drug development. Increases in the complexity of molecules entering the development pipeline along with stringent regulatory requirements require sophisticated instrumentation, technologies, and services. Avista Pharma offers sophisticated instrumentation and capabilities to assist its clients in solving the most challenging analytical problems, says Ahmed Abrahim, Vice President, Business Development, Avista Pharma Solutions. Some of the recent additions include more than 10 UPLC systems for high efficiency chromatographic method development; redundant ICP-MS instrumentation for analysis of elemental impurities; high resolution LC-MS for identification of impurities and MS-directed purification system for isolation and purification of low level impurities; and X-Ray Powder Diffraction (XRPD), Differential Scanning Calorimetry (DSC) and Thermogravimetric Analysis (TGA) instrumentation for polymorph screening and identification, material stability monitoring, standard characterization, and investigational studies. In fact, Avista Pharma recently helped a client solve a challenging problem at the ANDA filing stage of its generic drug. The client observed a new impurity in the HPLC impurity profile of a sample stored at a 40°C and 75% relative humidity storage condition (i.e. accelerated stability studies). In less than a week, the Avista Pharma analytical team isolated enough highly purified material for mass spectrometry (MS) and nuclear magnetic resonance (NMR) studies (i.e. both performed internally). MS data that was obtained included an exact mass measurement to determine the molecular formula. NMR data included the 1H, COSY, HMQC, and 1D NOE spectra to establish molecular connectivity. Collectively, the analytical data indicated a specific structure consistent with a reaction between the active pharmaceutical ingredient and an excipient in the drug product. “Our synthetic chemists subsequently synthesized this proposed compound and generated the analytical data to support the veracity of the proposed structure for the isolated impurity. In addition, the Relative Response Factor (RRF) of the impurity was established. With the information that Avista Pharma provided, the client was able to quickly make the necessary changes to its ANDA and moved forward to launch the product,” says Mr. Abrahim. An area of analytical services that has shown significant uptake in business is elemental impurity testing. This is driven by the new ICH guideline (Q3D) and USP <232>/<233> relating to Elemental Impurities, which presented the pharmaceutical industry with new challenges, says Mr. Abrahim. These challenges include the complexity of introducing new analytical technology, specifically Inductively Coupled Plasma (ICP)-based techniques replacing the qualitative wet chemical “heavy metals” limit test USP <231>. “It’s important for an analytical laboratory to provide a variety of techniques and equipment to support the development and manufacture of drug products,” says Michael Molloy, Technical Director at Boston Analytical. The lab has to identify and quantify critical constituents of the product and measure contaminants and degradation products. Analytical tools like chromatography (such as HPLC), mass spectrometry, ultraviolet or infrared spectroscopy, and thermal analysis are essential to adequately characterize the active molecule and excipients. An important characteristic for small molecules is the dissolution profile, which helps develop a strategy for bioavailability, and as an indicator of stability, looking at the changes in dissolution profile during a stability study at multiple storage conditions. 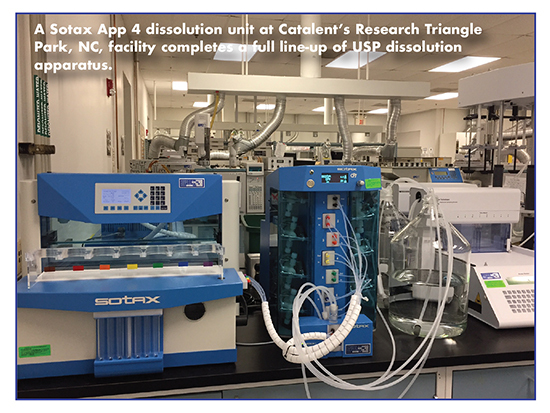 “There are several different approaches to dissolution, with instruments specialized for a particular type of drug product or device. It’s important for an analytical lab to have availability of all the dissolution approaches to test the many different types of products that benefit from it,” he says. Another important trend is in testing product packaging to ensure that it doesn’t inadvertently contribute any contaminants to the product. This is done with a sophisticated battery of tests under an extractables and leachables evaluation. The package is subjected to harsh conditions intended to break the material down and release contaminants. This helps identify those compounds that may eventually find their way into the product. Catalent’s analytical team in Research Triangle Park, NC, recently competed in the Conference on Small Molecule Science Method Development Olympics (MDO), an annual contest for teams from pharmaceutical companies and universities to compete in an analytical challenge designed by the MDO committee. All participating teams’ results are judged for: accuracy; ancillary information discovered; and creativity in approaches. Catalent’s team has entered three times and won one bronze and two silver medals. Building on its analytical expertise, Catalent recently added five robotics instruments for liquid sample handling. The new instruments are dedicated to GMP and GLP execution of molecular binding, cell-based assay, and flow cytometry analysis of biologic entities from peptides to viruses. 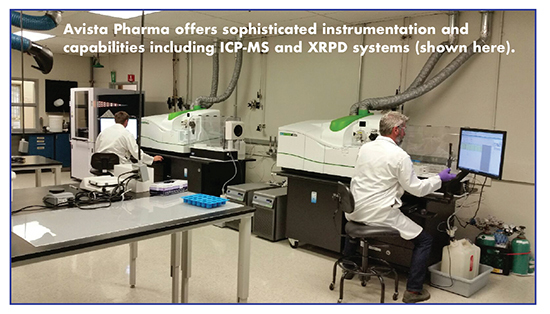 These new systems are housed within flexible cGMP and GLP laboratory spaces to maximize process flow. And, in the past several months, Catalent has received numerous requests for help performing gap analysis and additional lab work on forced degradations studies in accordance with the new guidance from ANVISA, the regulatory body of the Brazilian government. In 2015, ANVISA published the RDC53/2015 regulation outlining specific requirements in regard to reporting, identification, and qualification of degradation products for product registration and post-approval change submissions, and Guide nº 04/2015 for obtainment of the degradation profile, and identification and qualification of degradation products. Even though it is generally aligned with industry practices, the scope and depth of such requirements are expanded beyond the ICH guidelines with some specific requirements for forced degradation study at its core. For example, it specified what material should be studied, what condition must be used, and what results are acceptable and how their used in stability indicating method development. “Needless to say, the ANVISA forced degradation study regulation and guidance will have a huge impact on companies intended for product registration and post-approval change submissions in Brazil,” says Wei Pan, PhD, RAC, Director, Stability & Analytical CMC, Catalent Pharma Solutions. The past year also brought a request to develop an aqueous drug product in a polymeric, semi-permeable container closure system. Dr. Pan explains that during a leachables assessment, an unknown species was detected by GC-MS analysis. Through diagnostic mass spectral elucidation, the Catalent team determined that the unknown species was neither related to the polymeric materials of construction nor the known additive profile used in the molded component. Working closely with the resin material suppliers, the polymeric container manufacture, and client, the Catalent team designed a step-wise assessment of unmolded resin material and eventually identified the unknown species as a transformation product. Specifically, it was determined to be a hydrolysis product of a cross-linking terminator used in the manufacture of the virgin resin. With this new information, the Catalent team developed and validated the appropriate monitor and control methodology that facilitated timely approval of a novel drug product for a previously underserved patient population. For another client, Catalent used OptiForm® technology to develop quantitative methods to determine the crystalline content of an amorphous solid dispersion (ASD). Feasibility studies of powder x-ray diffraction (PXRD), modulated differential scanning calorimetry (mDSC), IR, Raman microscopy, and FT-Raman spectroscopy were conducted and showed that partial least-squares (PLS) analysis of FT-Raman spectral data proved the best methods. With a suitable method to generate homogeneous calibration standards and controls established for environmental on the FT-Raman spectrometer to maintain a constant RH for sample analysis, the optimized FT-Raman methods afforded the limit of detection of 1.5% and 3.0% for ASD and tablets, respectively. Dr. Pan says these methods were successfully used to support the stability tests of ASD and tablets. 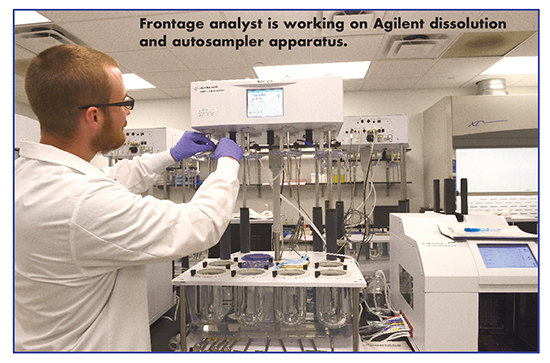 Frontage’s analytical scientists specialize in analytical method development, validation, and transfer for product development and clinical trial materials manufacturing support, as well as commercial product release and stability testing. Services are designed to help sponsors throughout the drug development process to fully characterize drug substances, developmental formulations, and commercial drug products. Frontage brings experience in analyzing a variety of dosage forms including oral solid, liquid, lyophilized, topical, and liposomes/emulsions/suspensions. Chemists’ expertise includes chromatography, dissolution/diffusion testing, UPLC, HPLC/MS, UPLC/MS, GC/MS, IC, ICP/MS, Karl-Fisher, and titrimetric methods. Dr. Kang Wang, Vice President, Analytical Services, Frontage Laboratories, says FDA expects that an in vitro drug release test method be developed for nanoemulsion drug products, through which the product quality is guaranteed from batch to batch. Frontage has developed a reverse dialysis in vitro drug release method and characterized one nanoemulsion product. “The method is discriminative and has shown batch similarity for validation batches, and differences between batches made under different conditions,” says Dr. Wang. FDA requires Q1/Q2 match and in vitro release test in some ANDA semi-solid product development. Frontage used GC/FID, GC/MS, HPLC/CAD, and ICP/OES instruments to determine excipient contents in reference listed drug (RLD) and proposed Q1/Q2 to FDA for several products. Also, Franz cells were used as an in vitro release testing tool and support drug product formulation development, he explains. 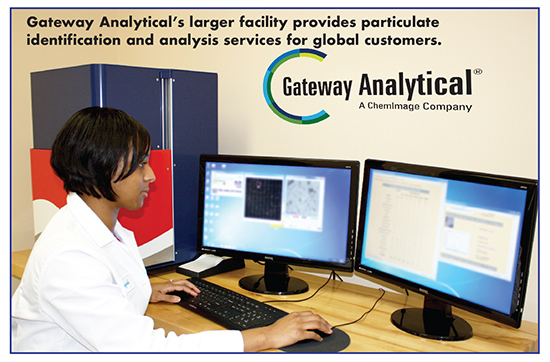 Gateway offers a full range of analytical services, including optical microscopy, manual and automated scanning electron microscopy, Fourier Transform Infrared (FTIR) spectroscopy, Raman spectroscopy, Raman Chemical Imaging (RCI), automated Raman (SPE), and HIAC particle counting. Gateway’s focus is on foreign particulate identification, sizing, and counting, ranging from hair and fibers to glass lamellae. In addition to characterizing contaminants, Gateway provides forensic expertise to determine the source of unknown and unwanted materials found in drug products. Gateway utilizes automated SEMEDS, RCI, SPE, and HIAC to perform count and size on particle populations, including foreign particulate (e.g. USP<788>), as well as performing count/size on drug ingredients (e.g. Ingredient Specific Particle Sizing). One particular trend in analytical testing is the Critical Path Initiative, says Mr. Exline, specifically how automated Raman technology (SPE and/or RCI) will play a role in the pharmaceutical industry going forward. The FDA introduced the Critical Path Initiative with the intent of modernizing generic drug development, and the Office of Generic Drugs recently supported approval of the first generic drug to utilize this approach. The size distribution of the active pharmaceutical ingredient (API) is critical as it relates to bioavailability, rates of absorption, and stability of the drug product, and this is where automated Raman technology is effective. “Drug manufacturers around the world look to leverage new processes that can get generic drug products to market faster,” he says. Orthogonal Chromatographic methods are preferred for determining the purity of oligonucleotides and measuring the levels of impurities. Oligonucleotides are a challenging class of polymers for chromatographic methods because of the combination of charged groups in the sugar and phosphate backbone while the bases contain both polar and nonpolar surfaces, says Dr. Jonathan Neidigh, Group Leader, Analytical Development, Nitto Denko Avecia. Dr. Neidigh explains that strong anion exchange and ion-pair reverse phase chromatography are the core methods in most analytical testing strategies. When the drug molecule is a duplex of oligonucleotides with complementary sequences, size exclusion chromatography or non-denaturing chromatographic methods are also required. While refractive index and multi-angle light scattering can be used for some conjugated oligonucleotides, most methods use UV detection where the large absorbance of the nucleotide bases provides high sensitivity. In addition, LCMS methods are frequently used to establish the identity of oligonucleotide therapeutics, quantify impurities that, due to their similarity with the therapeutic oligonucleotide, do not resolve chromatographically, and for supporting process development efforts. The introduction of chemical modifications to oligonucleotides leads to the need for complex sequencing methodologies. “Mass spectrometry approaches have been shown to be accurate, robust, and hence, attractive for assessing the sequence of synthesized oligonucleotide and to confirm it has the proposed theoretical molecular sequence,” says Dr. Edward Huber, Director, Analytical Development, Nitto Denko Avecia. At Avecia, electrospray ionization–mass spectrometry/mass spectrometry (ESI-MS/MS) is utilized for this required sequencing testing. The experimental approach is based on Collision-Induced Dissociation (CID) of the parent oligonucleotide, which results in a complex mixture of fragment ions of varying lengths and charge states, explains Dr. Huber. These experimentally generated fragment ions are identified and consolidated to rebuild the sequence of the parent oligonucleotide. This is accomplished by a combination of software and manual analyst evaluations. Experimentally, a High Resolution Mass Spectrometer equipped with a UHPLC connected online at the front end is utilized for these experiments. “The sequencing experimental approach has been fine-tuned by Avecia for obtaining experimental data with a quick turn-around time to meet short timelines and associated business demands,” says Dr. Huber. “Avecia has made this complex sequencing analysis routine and applies it on a near daily basis for confirming proposed molecular sequences of synthesized oligonucleotides.” Consistent with the regulatory requirement defined in the ICH Guidance Q2(R1) Validation of Analytical Procedures: Text and Methodology, the sequencing method has been validated by Avecia for multiple oligonucleotides. In the past year, SGS invested in new technologies and techniques within its laboratories to support biopharmaceutical development, including Hydrogen Deuterium Exchange Mass Spectrometry (HDX-MS) for higher order structure analysis services for proteins, and molecular binding kinetic and affinity determination via Bio-Layer Interferometry (BLI). HDX-MS complements orthogonally, but also provides additional data over other techniques such as Circular Dichroism (CD), Analytical Ultra Centrifugation (AUC), Size Exclusion Chromatography with Multi-Angle Laser Light Scattering (SEC-MALS), and Fourier Transform Infrared Spectroscopy (FTIR); ultimately allowing for a more complete and comprehensive submission-ready structural characterization package, explains Mr. Rogers. In fact, Mr. Rogers says that biosimilar comparability testing is a growing trend. Growing regulatory acceptance of such drug products is reflected by the increased number of products in the development pipelines. “Analytical structure and functional characterization is regarded by regulatory authorities throughout the world as a critical component of biosimilar development, as the structure and function of a molecule are key indicators if the target molecule of interest has been successfully recreated. In essence, even before purity and other critical quality attributes are optimized, confirmation of biosimilarity at the structural and functional levels is the first step in gaining an understanding of the originator, biosimilar, and ultimately if the desired output has been met.” These analytics are essential to define the Critical Quality Attributes that form the Quality Target Product Profile (QTPP) of the product. For biosimilars, Mr. Rogers says it is essential that the range of tests used during development are both sensitive and robust enough to detect any potential differences in structure and function between the biosimilar and reference. In addition, the techniques should be capable of quantitative as well as qualitative assessment of the quality attributes. Over the last 20 years, advanced technologies have been developed for structural characterization, and also the prediction of how the molecule will interact within the biological system. Regulators are now looking for orthogonal techniques – multiple orthogonal assessments to build a total profile of the molecule. The FDA introduced the concept of “fingerprint-like” analyses. This entails a carefully selected portfolio of characterization techniques for primary and higher order structure, together with biological and potency assays producing data, which add up to more than the sum of the parts. What remains to be explored is the link between the higher order structure and biological activities. Several complementary techniques are emerging from research backgrounds to address these questions such as HDX, 2D NMR, SPR, and BLI. “While the functional assessment of the bio-molecules action in a cell is still largely evaluated through quantitative cell-based assays, BLI allows us to quantitatively measure the strength and speed of those interactions at a molecular level,” he says. 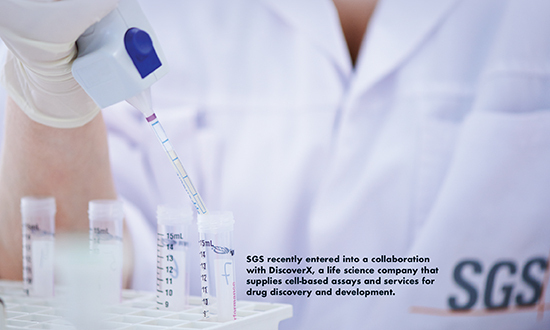 SGS recently entered into a collaboration with DiscoverX, a life science company that supplies cell-based assays and services for drug discovery and development. DiscoverX developed a series of cell-based assays that rely on the native biology of target receptors to quantitatively measure drug potency for the rapid identification of biosimilar candidates. SGS has been able to qualify these cell-based assays to establish biological activity and potency for three biosimilar targets. 1. Healthcare Analytical Testing Services Market by Type, by End User – Global Forecast to 2021, Reportlinker, June 15, 2016,http://www.prnewswire.com/news-releases/healthcare-analytical-testing-servicesmarket-by-type-by-end-user—global-forecast-to-2021-300285441.html, accessed Dec. 20, 2016.